Chelsea comes to NVG with 16 years of competitive coaching experience and was instrumental in starting TNT in the State of Arizona. She was a member of the Arizona T&T State Board from it’s creation in 2005 until May of 2016 as well as being a category 1 judge (the highest US rating). Chelsea has produced and coached multiple State, Regional and National Champions, Elite National Team Members, as well as coached athlete 8 athletes to World Age Group Championships/ World Championships. 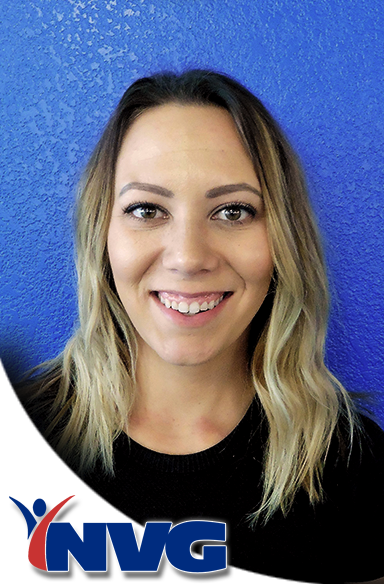 Chelsea is the current Regional Chair and oversees the T&T Program in Arizona, California, Nevada and Hawaii and is the 2014 USA Gymnastics Jump Start Coach of the Year. In 2015 Chelsea was named as the Assistant Trampoline Coach for Team USAs World Age Group Team and again in 2017 for Double Mini. In 2018 Chelsea was elected as the Junior Olympic Program Chair for USA Gymnastics as well as being named as the World Championships Double Mini Head Coach. In 2015 NVGs T&T program was also nominated as developmental club of the year by USA Gymnastics and in 2016, Chelsea was nominated as Elite Double Mini Coach of the Year by USA Gymnastics. In her spare time Chelsea enjoys spending time with her familty, playing with her puppies, doing CrossFit and traveling.